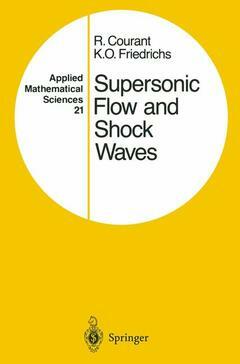 Supersonic flow and shock waves applied mathematical sciences vol 21 (reprint of the 1st ed interscience publishers, new york 1948 corr 5th printing) Courant Richard, Friedrichs K.O. Auteurs : Courant Richard, Friedrichs K.O. The Springer edition of this book is an unchanged reprint of Courant and Friedrich's classical treatise which was first published in 1948. The basic research for it took place during World War II, but there are many aspects which still make the book interesting as a text and as a reference. It treats basic aspects of the dynamics of compressible fluids in mathematical form, and attempts to present a systematic theory of nonlinear wave propagation, particularly in relation to gas dynamics. Written in the form of an advanced textbook, it accounts for classical as well as some fairly recent developments. The authors intend their audience to be engineers, physicists and mathematicians alike. I. Compressible Fluids.- 1. Qualitative differences between linear and nonlinear waves.- A. General Equations of Flow. Thermodynamic Notions.- 2. The medium.- 3. Ideal gases, polytropic gases, and media with separable energy.- 4. Mathematical comments on ideal gases.- 5. Solids which do not satisfy Hooke’s law.- 6. Discrete media.- 7. Differential equations of motion.- 8. Conservation of energy.- 9. Enthalpy.- 10. Isentropic flow. Steady flow. Subsonic and supersonic flow.- 11. Acoustic approximation.- 12. Vector form of the flow equations.- 13. Conservation of circulation. Irrotational flow. Potential.- 14. Bernoulli’s law.- 15. Limit speed and critical speed.- B. Differential Equations for Specific Types of Flow.- 16. Steady flows.- 17. Non-steady flows.- 18. Lagrange’s equations of motion for one-dimensional and spherical flow.- Appendix—Wave Motion in Shallow Water.- 19. Shallow water theory.- II. Mathematical Theory of Hyperbolic Flow Equations for Functions of Two Variables.- 20. Flow equations involving two functions of two variables.- 21. Differential equations of second order type.- 22. Characteristic curves and characteristic equations.- 23. Characteristic equations for specific problems.- 24. The initial value problem. Domain of dependence. Range of influence.- 25. Propagation of discontinuities along characteristic lines.- 26. Characteristic lines as separation lines between regions of different types.- 27. Characteristic initial values.- 28. Supplementary remarks about boundary data.- 29. Simple waves. Flow adjacent to a region of constant state.- 30. The hodograph transformation and its singularities. Limiting lines.- 31. Systems of more than two differential equations.- 32. General remarks about differential equations for functions of more than two independent variables. Characteristic surfaces.- III. One-Dimensional Flow.- 33. Problems of one-dimensional flow.- A. Continuous Flow.- 34. Characteristics.- 35. Domain of dependence. Range of influence.- 36. More general initial data.- 37. Riemann invariants.- 38. Integration of the differential equations of isentropic flow.- 39. Remarks on the Lagrangian representation.- B. Rarefaction and Compression Waves.- 40. Simple waves.- 41. Distortion of the wave form in a simple wave.- 42. Particle paths and cross-characteristics in a simple wave.- 43. Rarefaction waves.- 44. Escape speed. Complete and incomplete rarefaction waves.- 45. Centered rarefaction waves.- 46. Explicit formulas for centered rarefaction waves.- 47. Remark on simple waves in Lagrangian coordinates.- 48. Compression waves.- Appendix to Part B.- 49. Position of the envelope and its cusp in a compression wave.- C. Shocks.- 50. The shock as an irreversible process.- 51. Historical remarks on non-linear flow.- 52. Discontinuity surfaces.- 53. Basic model of discontinuous motion. Shock wave in a tube.- 54. Jump conditions.- 55. Shocks.- 56. Contact discontinuities.- 57. Description of shocks.- 58. Models of shock motion.- 59. Discussion of the mechanical shock conditions.- 60. Sound waves as limits of weak shocks.- 61. Cases in which the mechanical shock conditions are sufficient to determine the shock.- 62. Shock conditions in Lagrangian representation.- 63. Shock relations derived from the differential equations for viscous and heat-conducting fluids.- 64. Hugoniot relation. Determinacy of the shock transition.- 65. Basic properties of the shock transition.- 66. Critical speed and Prandt’s relation for polytropic gases.- 67. Shock relations for polytropic gases.- 68. The state on one side of the shock front in a polytropic gas determined by the state on the other side.- 69. Shock resulting from a uniform compressive motion.- 70. Reflection of a shock on a rigid wall.- 71. Shock strength for polytropic gases.- 72. Weak shocks. Comparison with transitions through simple waves.- 73. Non-uniform shocks.- 74. Approximate treatment of non-uniform shocks of moderate strength.- 75. Decaying shock wave. N-wave.- 76. Formation of a shock.- 77. Remarks on strong non-uniform shocks.- D. Interactions.- 78. Typical interactions.- 79. Survey of results.- 80. Riemann’s problem. Shock tubes.- 81. Method of analysis.- 82. The process of penetration for rarefaction waves.- 83. Interactions treated by the method of finite differences.- E. Detonation and Deflagration Waves.- 84. Reaction processes.- 85. Assumptions.- 86. Various types of processes.- 87. Chapman-Jouguet processes.- 88. Jouguet’s rule.- 89. Determinacy in gas flow involving a reaction front.- 90. Solution of flow problems involving a detonation process.- 91. Solution of flow problems involving deflagrations.- 92. Detonation as a deflagration initiated by a shock.- 93. Deflagration zones of finite width.- 94. Detonation zones of finite width. Chapman-Jouguet hypothesis.- 95. The width of the reaction zone.- 96. The internal mechanism of a reaction process. Burning velocity.- Appendix—Wave Propagation in Elastic-Plastic Material.- 97. The medium.- 98. The equations of motion.- 99. Impact loading.- 100. Stopping shocks.- 101. Interactions and reflections.- IV. Isentropic Irrotational Steady Plane Flow.- 102. Analytical background.- A. Hodograph Method.- 103. Hodograph transformation.- 104. Special flows obtained by the hodograph method.- 105. The role of limiting lines and transition lines.- B. Characteristics and Simple Waves.- 106. Characteristics. Mach lines and Mach angle.- 107. Characteristics in the hodograph plane as epicycloids.- 108. Characteristics in the (u,v)-plane continued.- 109. Simple waves.- 110. Explicit formulas for streamlines and cross Mach lines in a simple wave.- 111. Flow around a bend or corner. Construction of simple waves.- 112. Compression waves. Flow in a concave bend and along a bump.- 113. Supersonic flow in a two-dimensional duct.- 114. Interaction of simple waves. Reflection on a rigid wall.- 115. Jets.- 116. Transition formulas for simple waves in a polytropic gas.- C. Oblique Shock Fronts.- 117. Qualitative description.- 118. Relations for oblique shock fronts. Contact discontinuities.- 119. Shock relations in polytropic gases. Prandtl’s formula.- 120. General properties of shock transitions.- 121. Shock polars for polytropic gases.- 122. Discussion of oblique shocks by means of shock polars.- 123. Flows in corners or past wedges.- D. Interactions—Shock Reflection.- 124. Interactions between shocks. Shock reflection.- 125. Regular reflection of a shock wave on a rigid wall.- 126. Regular shock reflection continued.- 127. Analytic treatment of regular reflection for polytropic gases.- 128. Configurations of several confluent shocks. Mach reflection.- 129. Configurations of three shocks through one point.- 130. Mach reflections.- 131. Stationary, direct and inverted Mach configuration.- 132. Results of a quantitative discussion.- 133. Pressure relations.- 134. Modifications and generalizations.- 135. Mathematical analysis of three-shock configuration.- 136. Analysis by graphical methods.- E. Approximate Treatments of Interactions. Airfoil Flow.- 137. Problems involving weak shocks and simple waves.- 138. Comparison between weak shocks and simple waves.- 139. Decaying shock front.- 140. Flow around a bump or an airfoil.- 141. Flow around an airfoil treated by perturbation methods (linearization).- 142. Alternative perturbation method for airfoils.- F. Remarks about Boundary Value Problems for Steady Flow.- 143. Facts and conjectures concerning boundary conditions.- V. Flow in Nozzles and Jets.- 144. Nozzle flow.- 145. Flow through cones.- 146. De Laval nozzle.- 147. Various types of nozzle flow.- 148. Shock patterns in nozzles and jets.- 149. Thrust.- 150. Perfect nozzles.- VI. Flow in Three Dimensions.- A. Steady Flow with Cylindrical Symmetry.- 151. Cylindrical symmetry. Stream function.- 152. Supersonic flow along a slender body of revolution.- 153. Resistance.- B. Conical Flow.- 154. Qualitative description.- 155. The differential equations.- 156. Conical shocks.- 157. Other problems involving conical flow.- C. Spherical Waves.- 158. General remarks.- 159. Analytical formulations.- 160. Progressing waves.- 161. Special types of progressing waves.- 162. Spherical quasi-simple waves.- 163. Spherical detonation and deflagration waves.- 164. Other spherical quasi-simple waves.- 165. Reflected spherical shock fronts.- 166. Concluding remarks.- Index of Symbols.